Can even Batman survive being trapped underwater in a Full Body Cast? Justice League #11 continues the Drowned Earth crossover event that has seen defeated Oceanic Gods returned to Earth for revenge. 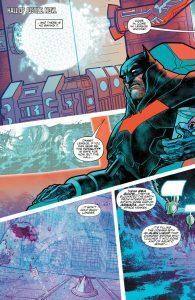 Over the course of the event the Justice League has been defeated and are separated across the globe while Batman is still incapacitated and stranded in the flooded Hall of Justice while protecting the Totality, a piece of the Source Wall that fell to Earth. Superman, Mera, and the Flash are on a quest to find a weapon that could end the invasion while Aquaman and Wonder Woman are questing to find Poseidon, the fallen god of earth’s oceans, in the hopes that he can restore order to the planet. Justice League #11 is another excellent chapter of this high-stakes crossover that will no doubt lead into the new status quo for Aquaman as we near the Kelly Sue Deconnick era. I loved the call back to Justice League stories of the past where the team separates into smaller groups as they all look for a solution prior to, what I assume will happen, joining back together to defeat the evil. I found Aquaman and Wonder Woman’s quest to be the most interesting as they search for Poseidon. There’s just something special when Wonder Woman and Aquaman join forces. It’s something that Grant Morrison hit on years ago in JLA that they are both royalty and have understand each other and the weight that rests on their soldiers due to their royal obligations. Batman’s frantic last stand is also compelling, especially since in the pages of Justice League he is still encased in a full body healing unit due to breaking every bone in his body earlier in the run (It doesn’t make sense with the other Bat books but just go with it). Superman, Flash, and Mera’s quest for Arion’s tomb is a great call back to the wonderful ‘80s series Arion: Lord of Atlantis. I’m interested with where it’s going and I’m hoping for an appearance of the Atlantian Magician at some point in this crossover event. The pacing in the issue was great as it moved from group to group to Batman and all three adventures leave you wanting more with their respective cliffhangers. Scott Snyder continues to impress with his take on DC’s premiere super team and this crossover event really exemplifies his excellence with these historic characters. His story pacing is great, as he knows when to switch scenes and writes a great cliffhanger. 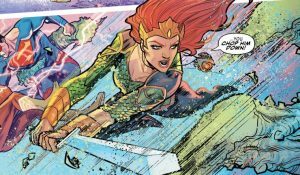 Francis Manapal’s art (pencils, inks, and colors) fits perfectly with the high action and adventure contained within the issue and his colors are vivid and deep, especially his water scenes that make the reader feel submersed. This creative combination has created a very entertaining comic and I look forward to seeing their next chapter in the Drowned Earth crossover. Verdict: Justice League #11is another excellent chapter in what has become a very enjoyable crossover event. With a great story and wonderful art Justice League #11delivers a compelling read that will leave you wanting more.